I am not a fan of hex maps in RPGs. Even at a resolution of 6 miles per hex they still have a precision like satellite images and show the land from a view that the people of an ancient or medieval world would never have. Making accurate maps from ground based observations requires precision instruments and complicated math and also a great amount of work and time that travelling treasure hunting vagabonds just wouldn’t be able to provide. It’s an anachronism in most fantasy worlds. But more importantly, and annoyingly, seeing the fantastic world of the game in a way that seems the same as maps we have of our own countries today evokes the unspoken assumption that distances and travel would also be the same. But it isn’t. Hex maps make the world feel small and tamed while in most fantasy games it should feel vast and barely explored. Hexes create order and structure. Which in a setting like the Ancient Lands is just poison to the intended atmosphere. Maps like those for the Forgotten Realms setting are a bit better but they still seem to be hand drawn recreations of satellite images, which I think plays a big part in why it feels like ren fair fantasy. The famous map from The Lord of the Rings is really great in that regard as it only shows the general relative positions of major features but still has huge patches of white paper everywhere. White space on maps is great. It’s like darkness in a movie. It’s entirely up to the audienc to imagine what could be found in it if someone where to look. And as long as it remains unanswered it adds to the mystery of the setting. The problem is that in an RPG you often need to be able to tell how long it takes the party from one place to another. Sometimes there are different routes they could take through different terrain, or they might choose to use or avoid roads and rivers. And in some cases you even want to know which one of two groups gets to a place first and how much time passes before the other arrives. For that you need a precision that a hex map can provide but a fuzzy map doesn’t. But thankfully there is a way to eat your cake and have it too. Chris Kutalik’s Pointcrawl system. Pointcrawling is based on the idea that within the game world there are only a limited number of locations the party would want to travel to and a limited number of possible paths between these locations. This makes it feasible to create a map in advance that shows all these locations and all the connections between them. The players only get a fuzzy map in LotR style while the GM has the same map but with all the known and hidden locations marked and the connections between them drawn in. It’s a nice system, but I think I have some more ideas that could improve it. When I looked at the movement speeds per day in B/X Dungeons & Dragons, I noticed that every possible speed per day is a multiple of 6. And the standard size for a hex is also 6 miles. Nice. 24 miles per day means 4 hexes per day. Well, if the hexes are plains. If you cross a hex by road it actually takes only 4 miles of your daily distance budget and if it’s forest it takes 8 miles and through mountains 12 miles. Now you have to juggle multiples of 6 and 4 at the same time and that means getting out a pen and doing some annoying fiddly calculations. But with a point map you can make things a lot easier for you. In the original pointcrawl system a dot is put on the paths for roughly every six hours of unencumbered walking time. But what if you are encumbred or you have small folk with different normal walking speed? The simple solution for all these problems is to make a dot for every “6-mile equivalent distance”. In a forest a segment represents 4 miles o travel, in mountains it stands for 3 miles of travel, and on a road for 9 miles of travel. 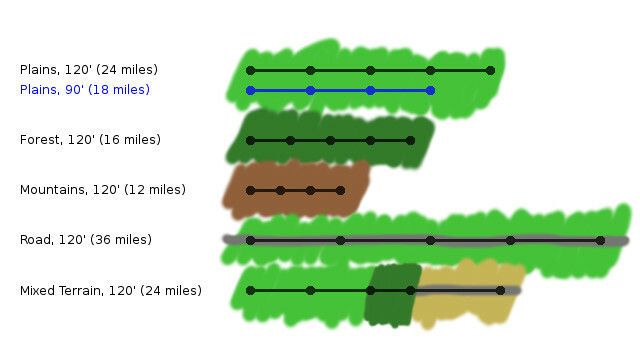 Since the underlying map is inherently fuzzy the length of the lines between dots does not have to always match up. The map does not show exact distances but only travel times through the use of dots. A special rule that I am using is that PCs can automatically forage for food at the cost of one segment of travel per day. Characters who prepare for the journey by packing rations can rely on these instead and get their full movement speed. I assume that foraging parties will always eat their old rations first and replace them with the things they find while travelling so rations never spoil regardless of how long ago the characters packed them. Effectively rations become a single use item that allows characters to move one additional segment per day. Marking the distance with dots is also useful as an aid for handling random encounters in the wilderness. One random encounter check is made for each segment. To keep the number of encounters roughly in line with those that would result under the recommendations in the B/X rules, different dice are used for different movement rates. Parties that travel two segments per day roll a d6, for three segments it’s a d8, for four segments a d10, and for anything greater a d12. On the roll of a 1, a random encounter happens. By pure coincidence, the odds of having a random encounter in a day for both two d6, three d8, and four d10 is almost exactly 33%. The same as the average for the Expert Set rules. The dots can be used to determine in what kind of environment the random encounter takes place and even the rough time of the day. If the party travels four segments in a day and a random encounter happens durin the third segment, it has to be early afternoon. (In fantasyland people measure time by the sun and the day is actually from six to six, not from eight to eight, and you get half you stuff done before noon.) If that third segment is mostly through forest, the encounter also takes place in a forest. I really like these little details that the game can hand the GM to make unprepared scenes more specific and interesting. I’ve never actually bothered to mention the time of day or the environment during a random encounter and have not seen it done by other GMs either. It’s something that is very easy to forget in the heat of the moment but can make encounters much more interesting and memorable. Just like reaction rolls and morale checks. Somewhat unrelated to the pointcrawl system I also like to have half a dozen or so floorplans for caves and campsites with multiple entrances prepared. If a random encounter leads to the possibility of the party tracking the encountered creatures back to their lair, one of these maps can be whipped out and the randomly rolled lair population and their treasure horde placed very quickly. By memory (I don’t own the book), I remember that the RpG “the One Ring” (set in Middle-Earth, as its name indicates) had a very interesting system for long-range travels in (N-W) Middle-Earth. Some members of the travelling party are assigned a specific function (ex: scout, hunter…) and each one has to roll for a definite task (food, avoiding accidents). The outcome of the dice is handled in a very generic way. This system is perfect for travelling parties which want to be as discrete as possible (rangers, Elves) and for players who have to cover very long distances but are not interested by random encounters. The One Ring journey attrition system puts the Epic back into epic adventures without the need for tedious bookkeeping. a seriously good idea. Real-life epic-ness comes from the privation during journeys that take longer than expected and survival (or not) of hardship induced by hunger, thirst or exposure as a result. Sometimes this can be because of mis-steps in the planning (Scott and his horses) or because of bad luck working against obstinacy (Shackleton). Sometimes it can be because of natural effects that no-one could reasonably predict such as bad storms or drought. Sometimes it can be because of acting on what turns out to be poor information. It is difficult to make this happen in an RPG without book-keeping and accusations of GM game-rigging, but The One Ring manages the whole affair so that a journey from the Shire to Mirkwood is something to be considered as a serious threat to one’s health *without* the need for encounters. This provides the much-needed separation of those who are willing to risk that (adventurers) and the stay-at-home types (NPCs). Yeah, TOR does travel in an interesting way. So does Torchbearer. I feel that all iterations of D&D and its retroclones are extremely ill equipped for this and I think I know the reason: It tries to simulate something that should not be simulated. Hours, days, rations, loadout, miles… these things are tedious and boring and *need* abstraction. Tedium is not the only problem: Travel time, encumbrance etc. are relevant only in the effects they have (are you quick enough to outpace the bandits, will you be exhausted after the chase, will you be starving halfway through the journey? ), but the game makes everything that leads up to these effect take a much bigger role than what actually matters. And because this is boring, we are drowned in “encounters” that usually don’t add anything to the *travel*-experience, but instead *distract* from the boredom of numbers-crunching. Travel should be constructed minding the end, the result, not the process. The process can very well be abstracted into a single Pathfinder test. Or you build a conflict system abstract and robust enough to make obstacles like “heavy rain” and “scorching heat” intersting (which few games, like Torchbearer and probably FATE, do). I want to translate this article to Russian and publish translation in my blog. Include a link to my original post and it will be fine.